Mobile devices have created another fundamental shift in how journalism is produced and distributed. Although it was forewarned by many, the speed at which mobile has come to dominate has taken many by surprise. In an effort to look further ahead and see what the next steps may be, mobile journalism expert Robb Montgomery gave his thoughts on where mobile will be heading next, speaking at the International Journalism Festival in Perugia yesterday. When Circa launched its atomised news service in 2012, their card system of presenting stories received a lot of attention. "This novelty will wear off and become a new standard," Montgomery said, but this will challenge the existing structures and workflows for journalists and publications. Those looking to work exclusively to mobile in the future will have to "think visually and consider the stream", he said, "and that's what it means to be mobile first." Jigar Mehta, head of engagement at AJ+, had earlier detailed the types of cards used in the app for the Al Jazeera digital channel, including art cards, quiz cards, debate cards and conversation cards. "Each piece of content we create fits on a card and is distinct," Mehta said. "A card can fit on multiple places and stories... and a story can build up over time." Reader apps like Zite present articles from all kinds of sources based on a few user-selected topics, but they also pick up on reader habits and preferences to find more relevant stories. "This app gets smarter the more you use it and that is a behaviour that should be standard for any news organisation saying they are mobile first," he said. "That storytelling experience is extremely satisfying for readers." By looking for trends or patterns in what stories readers click on, how much time they are spending on them and what sources they like, Zite builds a picture of what the reader wants and delivers it. With that kind of technology available, Montgomery said news organisations should be trying to do the same. "It has that positive feedback," he said, "using algorithms and smart learning to deliver a continually better product." 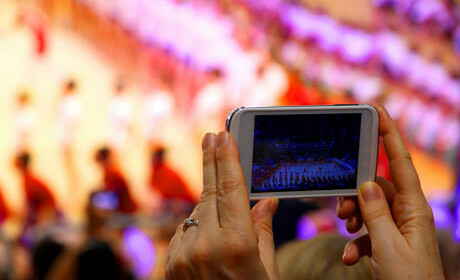 Mobile presents a difficult situation for video. It makes more ergonomic sense to hold a device vertically, using our thumbs for tapping and swiping, but our natural visual perspective is horizontal. Apps like Snapchat and Periscope are starting to turn the tide on horizontal video's technological ubiquity, but there are still issues in how our brain processes movement that can make vertical video an uncomfortable experience. There are some solutions to work horizontal video into a vertical frame, however. Splitting the screens across the middle can let producers show multiple angles from a horizontal perspective. This could be different shots of the same scene, or providing additional information. This can even be done when filming or livestreaming from mobile, he said, by using an iPad or other device to physically bisect the shot with the livestreamed scene above and information displayed on a screen that fills the bottom half. "You can have horizontal video in a vertical media experience," he said. "We're living in a world of small screens and short attention spans," Montgomery said of the new world of mobile consumption, and journalists need to be able to provide for this. Providing video for different platforms where an audience already exists, like Twitter, is one option, he said, especially since Twitter introduced their 30-second, in-stream video feature. With the capabilities of filming and editing apps now, it is easy to turn around packages on a mobile device, and Twitter users can film different shots and piece them together without leaving the app. For the 25th anniversary of the fall of the Berlin Wall Montgomery produced an entire story straight from his mobile devices, using a bicycle as a mount for tracking shots and publishing it to storytelling app Storehouse. Montgomery challenged delegates to think more visually in their reporting and experiment with the possibilities for mobile, detailing a range of story types and a process to bear in mind. Journalism.co.uk is running three mobile journalism courses in the next month, looking at data visualisations and interactives for social media, multimedia reporting for iPhone and iPad, and video reporting.